The Kaminario K2 all-flash array has the unique ability called Perpetual Array to scale, both up and out, and mix & match storage media and controllers. The session will cover deployment and management of Enterprise AI platform for industrial use case where training workloads are run on a Microsoft Azure cloud instance and the inference engine is run on premise, depending on the customer requirement and workload demand. Join us to learn more! Today SAP customers face challenges when migrating their existing environments to SAP HANA in-memory solutions, while addressing growing needs for hybrid scenarios. Integrated System NFLEX for SAP Environments, running under Windows as well as Linux, brings simplicity and flexibility to SAP operations. The easy-to-use, integrated converged platform runs on both, Windows and Linux. The solution manages all types of SAP applications as well as all other workloads. Join us to learn more! The 5th generation of Supermicro’s Twin Architecture has been optimized to support cloud application solutions. In this Webinar, we will learn how companies configure their cloud infrastructure to maximize the BigTwin’s compute, memory and storage resources with virtualization. We will take a deep look into how BigTwin offers cost-effective memory bandwidth, which is critical for cloud applications and NoSQL performance. Today, medical imaging accounts for nearly 70% of all clinical data stored at a healthcare facility, with terabytes of new data added daily. Developing a holistic Enterprise Imaging Strategy is giving healthcare organizations a more comprehensive platform with the ability to safely and securely present medical images within a patient’s electronic health record, enabling real-time collaboration and improving patient outcomes. Join Kim Garriott, Logicalis Principal Consultant of Healthcare Solutions, co-founder and current co-chair of the HIMSS-SIIM Enterprise Imaging Community and Chair, HIMSS Analytics Digital Imaging Adoption Model Global Development Team, and Tony Turner, a registered Radiology Technologist who manages NetApp Healthcare’s medical imaging partner alliances, for an insider view of what’s driving this change. Learn how to eliminate downtime, avoid future data migrations and accelerate cloud or AI adoption for medical image management. Unparalleled performance and enterprise-class capabilities are now available in the industry’s broadest portfolio of entry level UP servers and multi-node blades from Supermicro. Learn how you can now “do more” than ever before in this class of system, at the same entry prices. Together with latest Intel® Xeon® E-2100 Processor and Supermicro UP systems, the broad portfolio offers the right server optimized for your environment. For years, we’ve talked about the virtues of virtual desktop infrastructure (VDI). However, at the end of the day customers who invested time, resources and significant budget, often found that the benefits of VDI came with some hefty challenges. Complexity and time-to-value are difficult enough, but striking the balance between security and anytime/anywhere/any device access with has increasingly caused headaches for IT (not to mention the users!). Traditionally, securing apps and data meant keeping everything running in the data center, requiring IT to invest in expert resources to deploy and manage everything. In this session, you will see how these challenges have been addressed and how the barriers to adopting hybrid cloud digital workspaces are a reality with Citrix Cloud services deployed on Lenovo ThinkAgile HX. You’ll learn what VDI hasn’t been able to do, is now being delivered by Citrix and Lenovo. If you’ve already deployed VDI, we’ll show you how to relieve yourself of the burden of managing and maintaining a complex VDI environment, enabling you to put resources to better use. If you haven’t deployed VDI yet, we’ll show you just how simple it is to create secure, easy-to-use, and manage intelligent workspaces you and your users have been looking for. It’s called The Future of Work, and it’s here today. How to build productive storage with 6600 drives for RIKEN that ensures high data availability and storage performance with probable failure of the drives? How to build RAID with performance that can show full potential of advanced NVMe and Intel Optane drives? 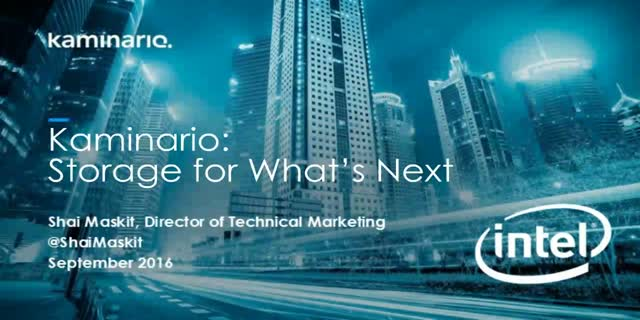 Join the webinar to learn more about how Intel technologies help us to deliver. Please join us as we discuss Lenovo ThinkAgile SX for Microsoft Azure Stack product enhancements. Since it was introduced there have been many enhancements made available by leveraging Intel technologies. In this session we’ll discuss all product enhancements with a focus on where Intel technologies have been critical and those solutions which are Intel Select certified. Software drives business disruption. No matter the size of your business, if you are serious about innovation and business transformation, you are required to build and deliver applications rapidly, reliably, and repeatedly. To compete, you must deliver application, content and services with greater speed, agility, and at scale. To sustain innovation, you must embrace continuous integration, continuous delivery, and DevOps. Join Red Hat, CloudBees, Intel, and Lenovo as we share best practices and technologies that drive IT Automation through CI/CD, and DevOps. In this webinar you will learn how Lenovo and its partners are changing how software is developed and delivered in today’s applications economy. Nor-Tech will show you how to make a better ROI on your investments in Simulation & Modeling software. Software license costs are 75% or more of your TCO investment in most Simulation & Modeling solutions. Nor-Tech’s Intel HPC Technology makes smarter use of your license investments for your software dollars. Nor-Tech 20 years in HPC Technology and their built-in adds called NT-EZ for your HPC Technology solution make them easy to use, and lower cost in many cases than using Workstations or the Cloud. An objective of enterprise IT is to architect and deliver a multi-purpose database infrastructure that serves various organization workload demands. In today’s data-driven environment, database systems must be designed to scale from low-end, tactical applications to high-end, strategic workloads and seamlessly accommodate organization data capacity growth. To maximize total value and ROI, longevity of the platform is critical. In this webinar, you will see how Lenovo solutions for SQL Server help you migrate, consolidate and modernize existing SQL Server database environments, and integrate end-to-end data flow/data management practices. This webinar will highlight deployment options for OLTP and Data Warehouse, based on enterprise needs and objectives. Performance benchmarks and Customer case studies summarizing business problems and solution benefits will also be shared. Your users need you to be more responsive, but when your hardware is keeping you from responding quickly, you look like the big roadblock. Learn how NetApp HCI makes your VMware private cloud environment easier to manage, so your users will quickly get off your back and back to work. Like businesses across all industries, the data center today is undergoing major transformation as enterprises and service providers strive to stay ahead of growing infrastructure demand. IT teams must prioritize critical workloads—and quickly deploy on optimal infrastructure—which is difficult and time-consuming, slowing the path to innovation. With Intel® Select Solutions—a suite of verified solution configurations from Intel—real-world, workload-optimized performance can be deployed for a future-ready data center. Today, a suite of Intel® Select Solutions across Cloud, Analytics, Storage, Network, and HPC is available on the market, with even more to come, all enabled on Intel® Xeon scalable platforms. In this webinar you will learn what a select solution is, how to meet your business needs, and how to get started. Deploying Intel® Xeon® Platinum or Gold processors with an Intel® Select Solution delivers verified solution performance ready to meet high quality thresholds for data protection and resiliency, while allowing more time and resources for innovative enhancements specific to workloads and use cases. The current solution using Red Hat’s OpenShift Container Platform and Container-Native Storage co-locates storage and applications, and provides resilient, scale out enterprise-caliber storage to workloads on OpenShift, enabling rapid and highly-available stateful and stateless applications on baremetal x86 systems. Out of a variety of projects, NetApp has developed a five-staged model to solve the challenge of data management in the Internet of Things domain. In this session you will learn how SAP helps customer get ready for the digital journey using SAP Business Objects for Analytics and SAP HANA. We will show, based on a real-world scenario, how IoT data are processed for predictive analytics and how a hybrid model with SAP Leonardo can be deployed. Legacy storage systems, like NAS, were architected when spinning disk and slower networking technologies were the industry standard. In this webinar, we’ll present five reasons why NAS can’t keep pace with the I/O demands of new deep learning workloads. To support these workloads, the data processing layer has to have immediate access to, and a constant supply of, data. Here NAS falls short, because the data gets bottle-necked between the compute and storage. WekaIO Matrix™ is a next-generation shared, distributed file system that visualizes the SSDs into one logical pool of fast storage presenting a global namespace to the host applications. Matrix was written from scratch to leverage the benefits of standard Intel x86 architecture combined with NVMe. The result is an easy to deploy, easy to manage storage architecture that is a radical departure from legacy NAS systems. By optimizing Matrix for flash, the storage solution is ideal for deep learning and high-performance computing workloads. Containers are increasingly becoming an important technology across a wide variety of industries and use cases. But oftentimes, provisioning of persistent storage is an afterthought, which leaves application developers stuck in a manual world waiting for provisioning requests, and IT operations teams scrambling to meet those requests. Project Trident is a dynamic storage provisioner which eliminates these issues and delivers the persistence applications require. Compatible with Kubernetes, Docker, Rancher, and OpenShift, Trident eliminates the manual provisioning of old and delivers a truly automated and dynamic persistent storage provisioning infrastructure. In this session, you’ll learn more about the challenge posed by persistent storage provisioning, how Trident solves those challenges, and view a demo of Trident in action. Digital transformation (DX) enables firms to expand their competitive differentiation by embracing data-driven decision-making processes, increasing customer satisfaction and retention, and/or getting better intelligence on the market. Intel, IBM, and Lenovo have partnered to deliver a unified, single platform approach to address an organization’s analytics needs – including Big Data, Enterprise Data Warehouse, and Data Science/AI. Join this webinar to learn the technical differentiation and business value the Lenovo Converged Analytics Platform provides. This data modernization platform enables Enterprises to rise to the challenge of DX through the convergence of data analytics workloads onto a single platform. Gartner predicts 40% of the top-20 businesses in every industry will be disrupted by the end of this year. Be prepared to not only survive, but thrive, by adopting an agile hybrid cloud solution and business strategy. Join Intel and VMware experts to get their private/hybrid deployment best-known-methods and learn everything you need to know to get going faster and remain competitive. This channel provides technical information on SDI solutions from members of the Intel Builders programs. The Intel Builders program bring together a broad ecosystem of solution providers to drive data center innovation through accelerated development and deployment of tools and documentation for cloud, storage, and network solutions. Leveraging Intel architecture, the ecosystem works to optimize solutions targeted at customer requirements. Members develop reference architecture, solutions briefs, and deployment guides to help accelerate deployment of these solutions.